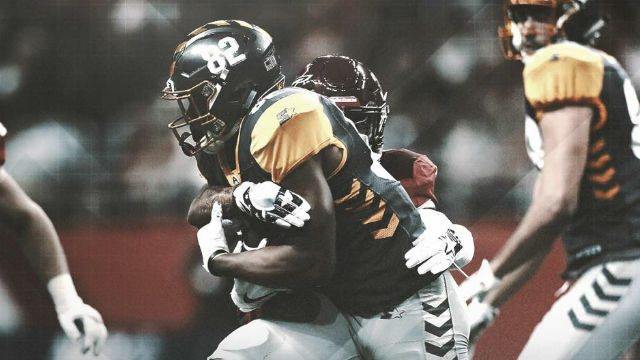 The San Diego Fleet was held to two second-quarter field goals in a 15-6 loss to the San Antonio Commanders Saturday evening as the Alliance of American Football made its debut with two games. Kenneth Farrow II ran 3 yards on the first play of the fourth quarter for the game’s only touchdown. The touchdown came two plays after Commanders cornerback De’Vante Bausby intercepted a pass by Mike Bercovici at the San Antonio 32-yard line and returned the ball 19 yards to the Fleet’s 49-yard line. The Commanders opened the drive with a 46-yard pass from Logan Woodside to Alonzo Moore, the game’s longest play. Farrow scored on the next play before a crowd at the Alamodome announced at 27,857. AAF rules require teams to attempt two-point conversions. San Antonio quarterback Marquise Williams was tackled short of the goal line on the two-point conversion attempt. The interception was the last pass Bercovici threw. He was replaced at the start of the fourth quarter by Philip Nelson. The Fleet was forced to punt after three possession on Nelson’s first drive. San Antonio then consumed the next 11:26 with a 17-play, 75-yard drive culminating with Nick Rose’s third field goal, a 28-yarder, with three minutes, 34 seconds left, to put the game out of reach. Bercovici was sacked six times and had two passes intercepted. He completed 15 of 25 passes for 176 yards on his 26th birthday. Nelson completed five of 10 passes for 68 yards. Coach Mike Martz announced after the game that Nelson would start the Fleet’s home opener, Feb. 17 at SDCCU Stadium, against the Atlanta Legends, a 40-6 loser to the Orlando Apollos in Saturday’s other AAF game. Bercovici completed 15 of 25 passes for 176 yards. The Fleet was outgained, 364-295, and trailed 24-17 in first downs and 35:18-24:42 in time of possession. Woodside completed 18 of 36 passes for 255 yards with two interceptions. He was sacked twice. Following a scoreless first quarter, Rose opened the scoring with a 29- yard field goal 10:39 before halftime. The drive began on San Antonio’s 7-yard line. Woodside began the drive with a 12-yard pass to Mekale McKay. Aaron Green had the Commanders longest run on the next play, a 21-yard gain that advanced the ball to their own 40- yard line. After an incomplete pass, Woodside completed a 37-yard pass to Greg Ward Jr., giving San Antonio a first down on the Fleet’s 23-yard line. A 7-yard run by Green and an unnecessary roughness penalty against Fleet defensive end Myles Nash gave the Commanders a first-and-goal from the Fleet 8-yard line. The Fleet defense then stiffened, as Woodside’s pass was incomplete, Green was tackled at the line of scrimmage and Woodside was sacked for a 3-yard loss. Rose kicked a 23-yard field goal on San Antonio’s next possession, eight plays after free safety Orion Stewart intercepted a Bercovici pass at the Commanders 1-yard line and returned the ball 68 yards. The Fleet got its first points on a 47-yard field goal by Donny Hageman 1:17 before halftime. An interception by strong safety Ryan Moeller at the San Antonio 36-yard line and 13-yard return set up Hageman’s 28-yard field goal with two seconds left in the first half.